The Active Directory Group reports enables the administrators to get a quick view of the Security Groups, Distribution Groups, Top big groups in terms of objects, and so on, in just a few clicks. These reports ensure that you are free from the taxing task of writing scripts for Active Directory reporting. 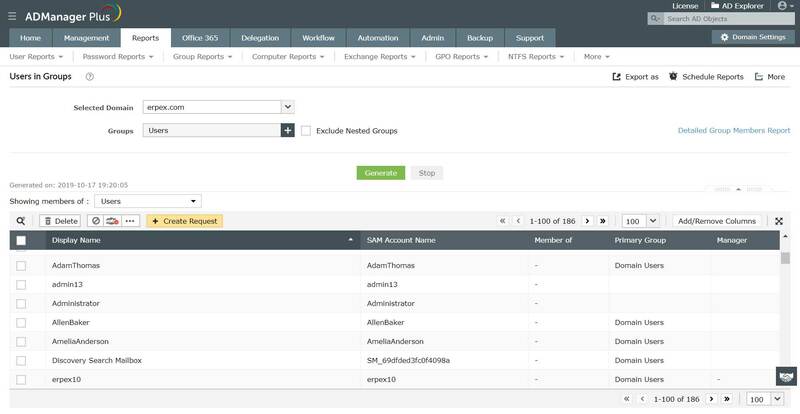 With this tool's GUI based, schedulable reports Active Directory reporting becomes simplified. Moreover, this tool simplifies even Active Directory management with its capability to perform management actions right from reports. Provides the details of the security groups available in the selected domains. A security group is used to group users, computers, and other groups to assign permissions to resources. Provides the details of the distribution groups available in the selected domains. The distribution groups are used to create e-mail distribution lists. Provides the details of the groups based on the type and scope of the groups. In other words, it reports on the group type details such as whether a group is security or distribution group, and also the group scope information such as Global, Domain Local, or Universal. This tool also offers reports to keep track of the groups that are created, modified or deleted from the Active Directory. To explore this Active Directory reporting tool's capabilities in detail, get the free download of its trial version. Report to get the list of groups in the domains that do not have any members. This helps the administrators to get the groups that are empty and are no longer used. Fetches information about all the members - Users, Groups, Computer and Contacts - of any Active Directory group including its nested groups. Select only the required Active Directory objects. Include/exclude specific attributes or choose only those attributes that you need in the reports, for all the selected objects. Option to view the fetched data in table format or as an object wise summary that can be drilled down to view specific details. Report to determine the big groups in the domain based on the number of objects they contain. Report to view the groups with managers. A group manager will have a complete control over the users in that group. Report to view the groups without managers. Get the free download of this tool's trial version to explore its 150 and more pre-built reports. In case the administrator wants to take stock of the group memberships of the users, this report will identify the users who are not members of selected group(s). Report to identify the groups in which a specific user is a member. This only lists the users in nested groups. For example, user John is a member of Users group, which itself is a member of Domain User Group. Hence John is also a member of Domain User Group. Apart from pre-built group reports, this tool also provides user reports, computer reports, group policy objects (GPO) reports, etc. for simplified and quick Active Directory reporting. Further, with its Exchange Server specific reports, this tool helps in Exchange reporting too.